As harsh a truth as this is: murder is one of Baltimore’s defining attributes. With hit shows such as CSI and Castle, the country has developed a morbid fascination with both death and the investigation of death. With increasing media awareness of murder rates and the HBO phenomenon The Wire, Baltimore has become the focal point of crime in America. So it’s only fitting that the groundbreaking dollhouse crime scene forensic tools (called “nutshells”) would be housed in Baltimore. They are used to this day to train investigators and medical examiners as they search for justice in Charm City. Even more fitting that the documentary Of Dolls & Murder, which focuses on these tools, would be narrated by Baltimore demi-god John Waters (Hairspray, A Low Down Dirty Shame). Waters’ narration opens the documentary with a somber tone that lures us into the macabre nature of the subject matter. The predominant person of interest in the film is a woman named Frances Glessner Lee. She, in what was either a stroke of independent genius or the result of a harrowing set of childhood playthings, came up with the notion of recreating crime scenes with dollhouses. The level of detail within the “nutshells” allowed investigators to have an untouched version of the crime scene to reference as they searched for the perpetrator. And the lack of actual dead bodies, smells and general unpleasantness created a more objective environment for the investigators to work with. Think of them as the world’s most intense game of Clue. I was particularly attached to this film because of my degree in Criminal Justice from the University of Maryland. During my time there I learned from Professor Tom Mauriello who uses dollhouse crime scenes to teach his students and who even wrote a book about those crime scenes. But this film isn’t just for crime buffs. Anyone who is exposed to the media in any way should watch this documentary. It’s very much about the relationship between representations of crimes and the actual crimes themselves. Incorrect or inaccurate ideas about how the system works and how evidence is collected have led to unnecessarily hung juries and a largely misinformed public. One recent phenomenon that the film focuses on is the “CSI Effect.” This is essentially a term used to describe the unrealistic expectations that modern juries have with regards to the amount of evidence present at a crime scene. A few decades ago, if a man was seen entering his house around 9 and leaving around 9:05 and the next day his wife was discovered dead and in bed with her lover…it was pretty clear what happened. A thorough investigation should always be conducted, but some cases are more clear-cut than others. Nowadays, the jury has too many questions. All can be relevant questions, if you know what they mean (and not many actually do). But none of those pieces of evidence need to be present in order for the evidence to be sound. I know that because I learned it in college, but you can learn it if you watch this film. The movie is an interesting conundrum in that it uses the popularity and familiarity of crime procedural television shows to entice you into learning why those very shows are inaccurate. Season 7 of the original CSI (my personal favorite season) involved a storyline that was directly influenced by the nutshell crime scenes. So the documentary shows footage from those episodes and even interviews the show’s writer and then-showrunner, Naren Shankar. Take it from me, it can be annoying to hear real-life investigators complain about investigators on TV. Because of course it’s not 100 percent accurate but they take it very personally. It’s quite refreshing to hear the same point of view from one of the people who produced the actual show. What Naren explains, and I’ve heard additional things on behind-the-scenes features for the show, is that their science isn’t unsound but many other aspects of the show are exaggerated. For instance, the crime lab as seen on the show has monumentally more resources and people available than basically any other crime lab in the country. And though the tests that are seen on the show are real (for the most part) they take significantly more time to complete in real life and often don’t give investigators a fulfilling answer. Ordinarily this type of “Sylvester Stallone couldn’t actually shoot his handgun that accurately in real life” nit-picking annoys me. But it becomes very important when dealing with the actual judicial system. As exciting as the film was for me, I think it would be even more exciting for people hearing a lot of these insights for the first time. 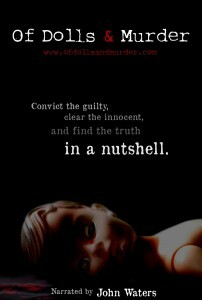 Of Dolls & Murder is lengthy enough at 67 minutes to be thorough and informative and short enough at 67 minutes to keep its momentum and intrigue going from beginning to end. Baltimore/Maryland locals should make their way over to the historic Hollywood Cinema 4 in Arbutus, Md., for the screening at 7 p.m. June 5. It’s a great opportunity to not only see the film, but also interact with the filmmakers and law enforcement personnel who contributed to the film.